Chocolate chip, mint, gingersnap-what’s your favorite cookie? Well the answer is obvious; it’s me of course! 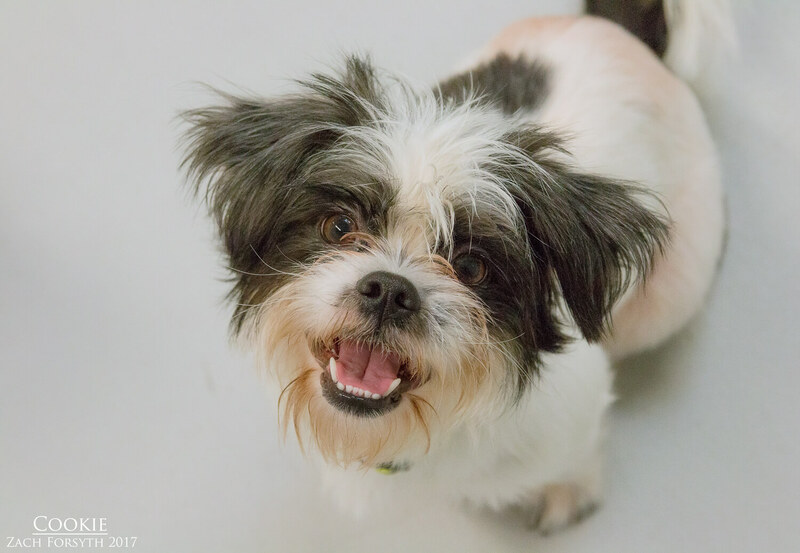 I am a 1 year old Shih Tzu mix weighing in at 13lbs. Though my origins are a mystery, you can tell I never had the chance to play with the other kids or really explore the world. So new situations and people are pretty overwhelming and can be a bit scary. With a few hotdogs and some time, I eventually warm up and ready to play play play! In fact, the Pixie staff say I really enjoy playing with toys. Just haven’t quite figured out the fetch part quite yet, but you could teach me! I do have some doggy friends here at Pixie and really need a playmate that suites my energy level. I can be quite wiggle worm, you know! With all the newness here, I am really just wanting some rest and relaxation out of the shelter. I am looking for an experienced sensitive dog foster or adopter who will be committed to my training to gain more confidence! I need a low traffic adult only owned home with no kids or cats. Fill out a foster or adoption application today, so we can meet! I come to you spayed, micro-chipped, and vaccinated for an adoption fee of $350.